NVIDIA (NASDAQ:NVDA)’s autonomous driving ambitions have come under fire from none other than its long time rival AMD (NASDAQ:AMD) as the company has reportedly entered into an IP cross licensing agreement with Tesla (NASDAQ:TSLA). As we had previously reported, Tesla had been building the ultimate dream team for creating its own AI chip led by none other than Jim Keller, the legendary CPU architect that designed Apple’s initial A4 and A6 chips as well as the creator of the Zen uArch that single-handedly put AMD back on the map. Tesla has been building up for this moment for quite a long while. They have been aquiring talent from various fields and clearly have big ambitions in the autonomous driving segment. While they had the talent before, the one thing they did not have was a cross licensing agreement in place. As I pointed out in my Apple GPU write-up, there is no such thing as a new chip (whether that’s GPU or CPU) nowadays, everything builds upon existing IP so even if you have the talent, you can’t really just go ahead and design your own chip till you have IP cover from the handful of companies that can provide them. While NVIDIA has extensive GPU and GPGPU IP, there is just one company on Earth that can shelter you from both CPU and GPU IP strikes – AMD. With AMD’s blessing, and a cross-licensing agreement in place, Tesla has everything it needs to make its AI dreams come true. The architecture and silicon will have to be designed in-house, with AMD providing all the help Tesla needs and will be outsourced to fabrication facilities like TSMC for production. This would allow seamless unification of the ‘brain’ of Autopilot and Tesla’s ambitions and would be an ideal-case scenario. It will allow the company to lead the autonomous driving initiative (even more so than it does right now!) and actually act as a primary supplier of autonomous tech to other car manufacturers. So becoming an IHV for autonomous driving tech is definitely on the table right now. This is something that would play well with investors considering it would mean a completely new stream of income for Tesla. We expect AMD stock to increase in positive outlook due to this development since it increases their diversification aspect quite a lot. 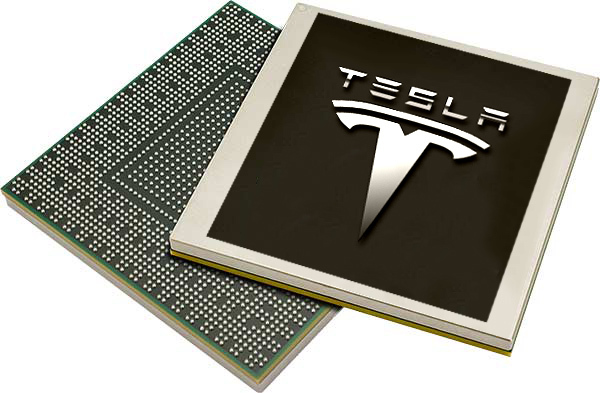 It could adversely impact Tesla’s stock however since creating your own chip will not be cheap (at least not initially) and could lead to risks related to mission critical hardware. This of course means that AMD is going to be seeing a revenue stream from its 5th semi custom chip soon and that it has finally broken into the self-driving market – at NVIDIA’s expense. This news is actually just as material for green as it is for red. In fact, NVIDIA has basically just seen its self-driving segment come under direct threat – one that could even lead to losing out its biggest customer. Before we go any further lets look at what made NVIDIA’s partnership so strong. The previous supplier of Tesla was Mobileye and while their EyeQ3 chips were good enough for very basic autonomy, they were nowhere near capable enough for a completely autonomous car. They were ASICs that were built with very limited horsepower and a very strict and inflexible design. NVIDIA’s approach on the other hand was a breath of fresh air for the company. Their GPGPU approach gave them unparalleled flexibility and an unbelievable amount of power and upgradability. Mobileye could not hope to keep up with NVIDIA’s GPU power scaling and simply did not have the resources to match them. In other words, the battle between Mobileye and NVIDIA was pre-decided from day 1. AMD on the other hand can provide GPGPU IP to Tesla, meaning that should they chose to, they can come up with a GPGPU design in-house easily now. With Jim Keller on board, they can even go for a unique hybrid chip that utilizes the best of both worlds. While I am sure that NVIDIA’s offerings would still beat any first generation chip quite easily, the fact that they have Jim Keller and AMD putting heads together to come up with a semi custom design isn’t a particularly pleasant thought for NVIDIA – because they are bound to succeed sooner or later. There is also the possibility that Jim Keller chooses not to go with a (primarily) GPGPU design and instead makes an AI chip that is closer to a CPU (serial) than it is to a GPU (parallel). Such a product could put NVIDIA’s vision in serious risk (since it is based on advocacy of the GPGPU approach) and could even end its self driving ambitions. In simple terms, Mobileye was a serial approach that was heavily outdated and NVIDIA had presented a parallel approach to computing that worked much better – if Jim Keller comes up with a serial approach to self driving AI then it would put the former’s efforts in serious jeopardy as the largest autonomous driving manufacturer dumps it for the other. NVIDIA’s stock has been on a bull run since the past couple of weeks and actually reached its all time high this week. This (adverse) news coupled with their very high P/E multiplier means that we would advise extreme caution when trading with NVDA right now, since a market correction could very easily happen.